One of the iPad's best games comes to iPhone...and it's terrible. Some things seem like a good fit, but don't belong together. Just look at Geometry Wars and the iPhone. At first, we cursed Activision for bringing the popular twin stick shooter to the iPad first. 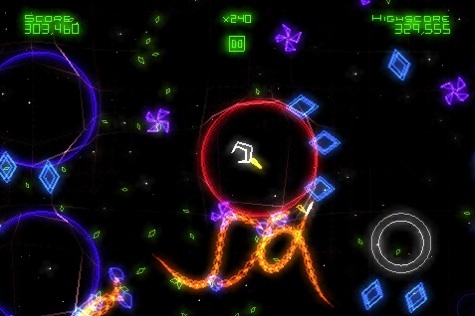 Now that we have it, in the form of Geometry Wars: Touch, it's obvious that this was a marriage made in Hell. Don't buy this expecting the same level of quality on Xbox Live or even Apple's tablet. It's a mess. We first grew irritated with the screen, as it's much too small for Geometry Wars. The game, where you guide a tiny ship around a grid, blasting enemies to achieve high scores across multiple game types, forces you to maneuver/shoot with two on-screen analog sticks. That's fine if you have a hefty piece of real estate (ala the iPad), but here, it's impossible to see everything with two fingers obscuring at least 15-20 percent (or more) of the playfield. As soon as you build up a decent run, along comes something from the bottom right or left corner to ruin everything. In addition, the game suffers from slight performance issues whenever too many bad guys clog the screen. That's unacceptable for a game that requires split second decisions to survive. We also despise the controls. With the Xbox 360 Geometry Wars games, you guide the ship with the left stick and fire with the right, without question the most precise way to play. Here, you rely on those aforementioned virtual sticks, and you'll struggle duplicating the same level of success on the iPhone. Once your fingers warm up and lightly stick to the screen, it's almost impossible to make that ship move in a desired direction. 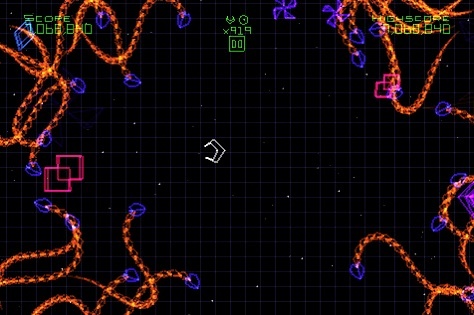 It's one thing if it's a racing game with wide turns, but with Geometry Wars, you need to thread the needle through large swarms of enemies, and that's much too difficult to achieve. At the very least, Activision deserves credit for pumping the game full of content. Not only does it come with seven single player modes, but there's also multiplayer via Bluetooth, achievements to unlock and online leaderboards. That's plenty to justify spending $4.99, but the gameplay (clearly the most important part) takes a header into a concrete wall. There's still hope. Activision could always adjust the sensitivity and make performance tweaks, but for now, stay away from Geometry Wars: Touch. Although it shares the same type of content as its iPad and Xbox 360 counterparts, it's much too frustrating to warrant a purchase. What's Hot: All of the content from the iPad version at half the price. What's Not: Annoying controls, performance issues, fingers obscure parts of the screen.